Peoria, Arizona is a dynamic desert community northwest of Phoenix with more than 154,000 residents. Founded by settlers from Illinois in 1886, this onetime farming community was one of the nation’s fastest growing cities during the recent growth boom. Officially incorporated in 1954, the city has grown from the original one square mile in Oldtown Peoria to more than 176 square miles of beautiful Sonoran desert in both Maricopa and Yavapai counties. 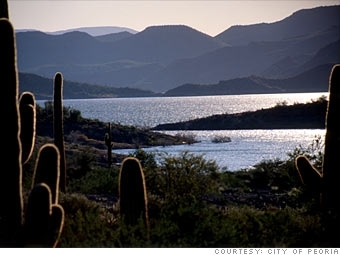 The city is home to Lake Pleasant – the state's second largest lake; and the Peoria Sports Complex – spring training home of Major League Baseball’s San Diego Padres and Seattle Mariners. Peoria boasts other award-winning facilities including the Peoria Center for the Performing Arts and Rio Vista Community Park and Recreation Center. The city also is proud of its relationship with the arts community, including non-profits such as the Challenger Space Center, West Valley Art Museum, and Arizona Broadway Theatre. Those attractions along with 35 miles of hiking trails, top-notch schools, well planned residential neighborhoods and an enticing variety of shopping, dining and entertainment options led Money magazine to rank Peoria among its 100 "Best Places to Live" in 2008.